Danskin prefer the use of 22mm thick Egger Protect P5 Moisture Resistant Grade Chipboard (CE marked chipboard manufactured to BS EN 312 : Part 5). The chipboard is faced on both sides with thermosetting resin impregnated paper which, according to Egger, negates the need for a Vapour Control Layer immediately below the board providing a suitable DPM is in place. All panels are tongued and grooved on all four edges and supplied in sheet size 2400 x 600mm. 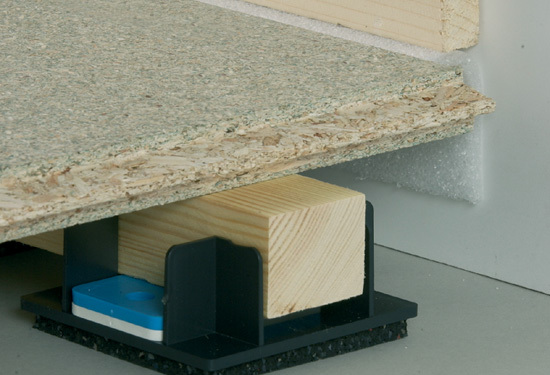 Where ordinary unfaced P5 chipboard flooring or plywood is used a vapour control layer of minimum 500 guage polythene (by others) should be laid above the insulation and below the floor boarding to protect it from residual moisture in the concrete absorbed during construction or from exposure of the slab to the weather. Where necessary, WBP Spruce Plywood, CE marked and manufactured to BS5268-2:2002 can be supplied. 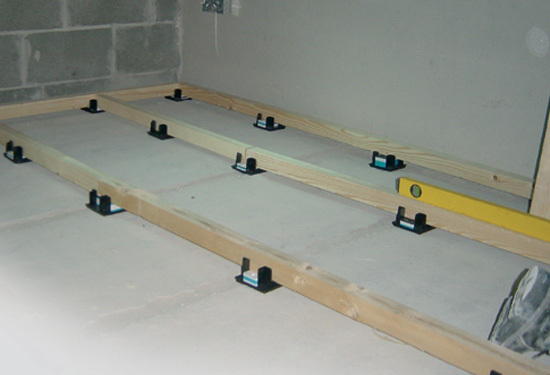 Preservative treated Softwood Support Bearers are placed within the saddles to support flooring panels. They are 47mm (Nom.) wide and supplied in 1800mm lengths for ease of handling. They are available 52mm high, 77mm high and 87mm high for use with 50mm, 75mm and 85mm insulation foam. The bearers are strength graded to comply with TRADA recommendations on spanning elements. The bearers are laid at 600 mm centres when used under normal domestic loadings (UDL of 1.5kN/m2 and concentrated load of 1.4kN). All timber is ordered from legal and sustainable sources and is generally PEFC certified. Perimeter Insulating Strips are placed at the edge of the floor to insulate the gap between the wall and the perimeter support bearers. They are formed from rigid insulation foam and have a flexible closed cell foam upstand bonded to one edge. 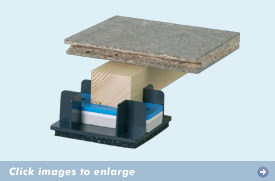 The compressible closed cell foam upstand sets out the necessary 10mm perimeter expansion gap for the chipboard. Perimeter Insulating Strips are available to suit 50mm, 75mm and 85mm insulation and come in 1800mm lengths. 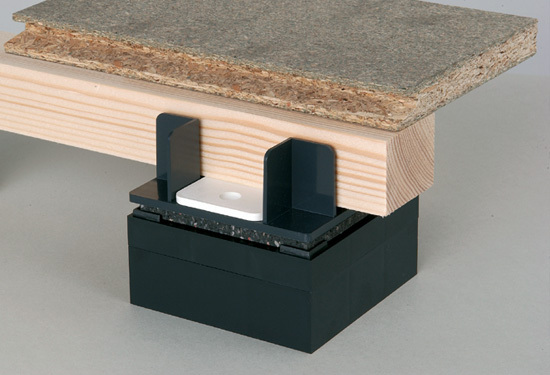 In accordance with Accredited Details it is also recommended that a non setting mastic bead is applied between the skirting board and the top of the flooring to prevent air leakage. 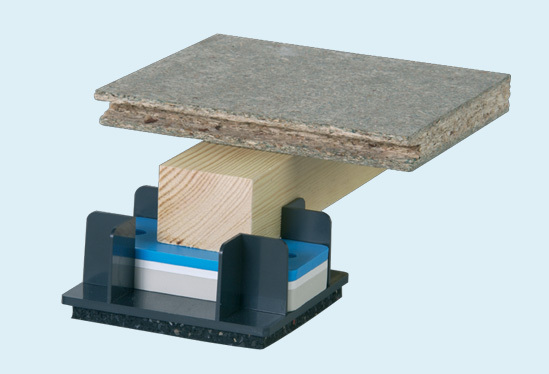 The Danskin Thermal Saddle System incorporates Knauf Polyfoam extruded polystyrene insulation boards. Polyfoam has excellent thermal conductivity and low moisture absorption properties making it ideal for ground floors. The boards are prefabricated to a 2400mm x 555mm size which ensures that they fit neatly between support bearers laid at 600mm intervals without further fabrication on site. Only turn out sizes need to be cut. The boards are available in either 50mm, 75mm or 85mm thicknesses depending on U Value requirements and are carried on the protruding ends of the saddles and packers. Packing is provided by means of innovative, self locating plastic packers which are made in 3,4,5 and 10mm thicknesses. The unique, patented packers interlock with each other and with the Saddle. They are colour coded for ease of identification and are placed within the Saddle to achieve the levelling of uneven subfloors. Danskin Thermal Saddles are 97mm x 97mm square and have a tough, injection moulded plastic headcap adhered to a high performance foam resilient layer. The recycled foam layer has excellent thermal insulating properties and is highly resistant to moisture absorption. The headcap holds the Support Bearers to which flooring panels are fixed. Each saddle headcap has two small holes in the surface to lock packing pieces in place and can accommodate 29mm of packing to level the floor. The ingenious design of the headcap means that the protruding ends of the saddles or packers fully support the precut insulation panels without having to shape the insulation in any way. The standard height of the Saddle with the resilient layer attached is 11mm. Saddles are laid at 600mm centres under normal domestic loadings. Elevating blocks are made from injection moulded plastic and they can be placed in combination below Saddles where floor variations are extreme up to a maximum height of 150mm. They interlock with the saddles and with each other and extend the height of systems to cope with major deviations in levels. The blocks come in 15 and 30mm thicknesses.